WinForms UI component that allows the user to click it to perform an action. 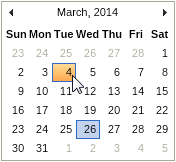 The NOV UI Button is a content element that provides support for a click event. The fact that the button is a content element means that it can contain every widget. The NOV UI for WinForms supports different types of buttons - Push, Repeat, Toggle and other buttons. This is the most commonly used type of button. Typical examples are the Ok and Cancel buttons of a form or dialog as well as for other "actions" that the user may need to perform. Repeat buttons are represented by the NRepeatButton class, which is derived from NButtonBase. When pressed, the repeat button raises its Click event repeatedly at user specified intervals of time. NOV Repeat Buttons allow control over the Delay and Interval properties. Toggle buttons are represented by the NToggleButton abstract class. which is derived from NButtonBase. When clicked toggle buttons toggle the value of their Checked property. Symbol Toggle Buttons are toggle buttons that usually display a different symbol when checked/unchecked (check boxes and radio buttons for example). A Check Box is toggle button that allows the user to make a binary choice. It is represented by the NCheckBox class. A Radio Button is a toggle button, that allows the user to choose only one of a predefined set of options. It is represented by the NRadioButton class. To be fully functional the radio button must be a descendant of a NRadioButtonGroup. Table Picker Cells are the building blocks of all table pickers such as calendar pickers, palette color pickers, hatch and gradient pickers, etc. NOV also provides several other types of buttons, such as the Drop Down Edit Button, Split Button etc. These specific buttons are internally used by more complex NOV widgets. NOV Button widget is styled with CSS. NOV initially comes with the following themes: Windows 8, Windows 7, Windows XP Blue, Windows Classic (with all color scheme variations) and Mac Lion.